In this publication by Dr Ca thy Swift, specific evidence from literary and legal texts written in Old Gaidlig and Old Irish are explored. In certain instances they describe the style of early medieval brooches of Northern Britain and Ireland and their location on the body of the wearer. The texts not only indicate the status of the individuals wearing brooches but also give information on the employment and status of the craftsmen who made them. 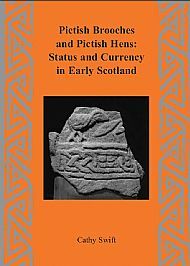 This information is then compared with the archaeological corpus of Pictish brooches. It is suggested that their wearers were probably the highest rank of aristocratic lords and minor kings, but not the highest rank of Pictish Kings. They included both men and women. It is also suggested that in value such brooches represented the equivalent of between 6% and 11% of the annual income of one of the highest lords from his base clients.